Mayplace Lane may at first sight seem like a typical back alleyway running to the garages behind houses in Eglinton Hill, but it’s much more than that. 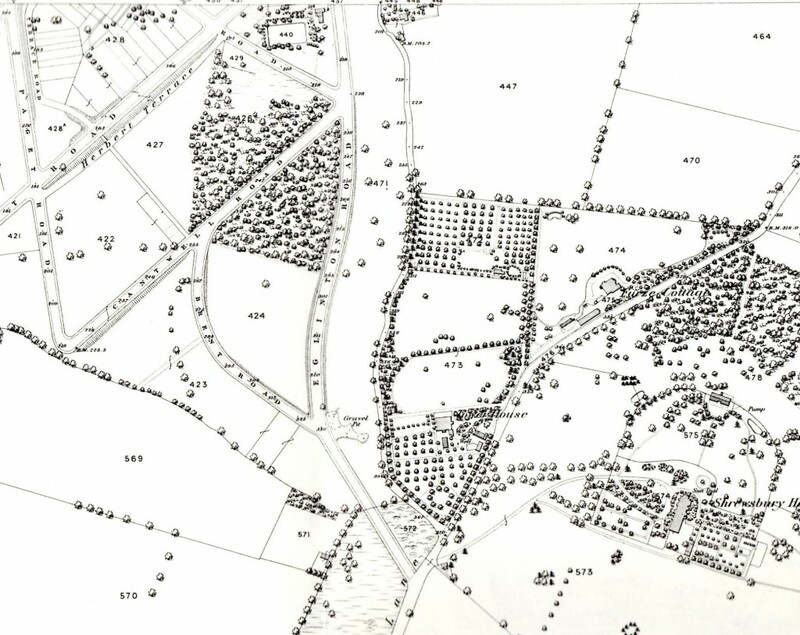 As you can see in the snippet from Alan Godfrey‘s 1866 OS Map of Shooters Hill it was there before the houses in Eglinton Hill were built, winding down behind Tower House parallelling Eglinton Hill. The Lane is thought to be part of a track that went all the way down to the Woolwich Marshes, following the line of Sandy Hill Road. According to the Survey of London Volume 48 on Woolwich, Sandy Hill Road itself “was laid out along the line of a footpath that rose diagonally through what had been called Hilly Field”. So it seems that before the roads we now know were laid out Mayplace Lane ran from the Bronze Age barrow in Plum Lane all the way to the marshes that once bordered the Thames. 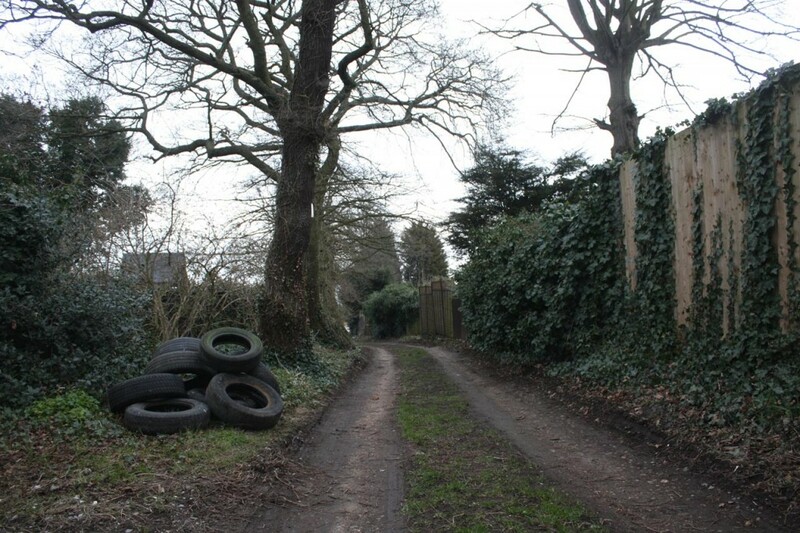 In the past the Royal Borough of Greenwich Clean Sweep team have removed fly-tipped rubbish, though they maintain that they don’t have to because Mayplace Lane is an unadopted road. Frustratingly the current piles of rubbish have been there for some time and consequently are being scattered over a wider area. A twitter exchange about the rubbish last week has led to e-mails being sent to our local councillors, MP Clive Efford and London Assembly Member Darren Johnson to try to get some action. One suggestion, which I thought was a good idea, from @Twinsclubplus was that we should have a “Friends of Mayplace Lane”, which I guess would be a bit like the “Friends” groups that look after local parks. It could keep an eye out for fly-tippers, make sure any tipping was reported promptly, perhaps help clear up the Lane and lobby towards getting a more permanent solution to the problem such as a lockable gate up at the Plum Lane end. Please let me know if you’re interested in being involved with a “Friends of Mayplace Lane” group on the usual e-mail hilly@e-shootershill.co.uk. Of course fly tipping is not confined to Mayplace Lane: it’s a borough-wide problem which has been going on for years. In the past the local neighbourhood watch and the 853 blog have both explained what to do about it, but here’s a reminder. We will remove all small flytips (equivalent to a small van load) within 24 hours and, if possible, take action against those responsible. Large flytips, classified as anything larger than a small van load, will be dealt with by contractors within four working days on a priority basis. Any items that have been fly tipped at the side of the road will be collected and separated for recycling. Our teams will endeavour to stop and collect any fly tips they find, unless it would prevent them from completing their scheduled or booked work in which case they will report it so a dedicated team will remove the fly tip. 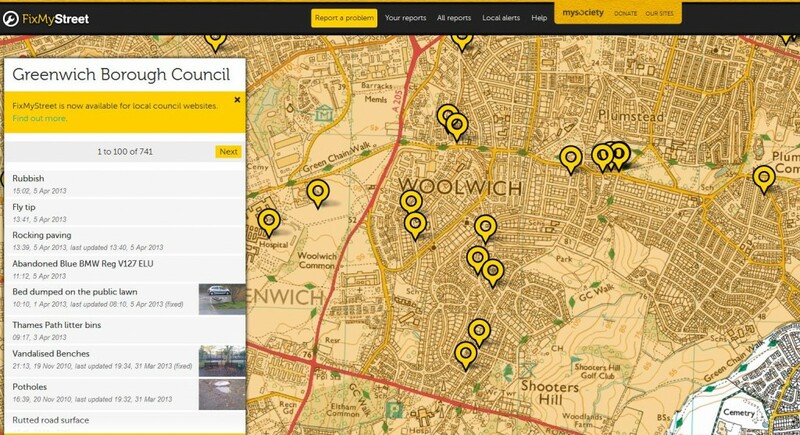 Another way of reporting fly tipping, and other problems, is to use the FixMyStreet web site, which will then forward the report to the council. This can be done either by entering a post code or interactively using their map. It allows you to attach photographs of the problem too. On FixMyStreet you can easily see all the problems reported in your area, as shown in the screen grab below. I wonder how long Mayplace Lane has been there? It’s intriguing that it runs from the Plum Lane Bronze Age Barrow, one of what was once a barrow cemetery of 6 barrows, down to the Woolwich Marshes. Recent archaeological finds at the Plumstead Crossrail site have suggested that Bronze Age people may have built wooden causeways across the Plumstead Marshes similar to those that spanned the marshlands of the Somerset levels. Bronze Age remains have also been found just over the river in North Woolwich. During the Bronze Age it is believed that people distinguished between the land that they lived in and farmed – the land of the living- and the land of the ancestors where their burials took place. Could Mayplace Lane have been their route from their villages around the Woolwich and Plumstead marshes up to the sacred Shooters Hill summit, the land of their ancestors? It just drives me crackers that people think its acceptable to just dump their dirty old mattresses out on the street along with all sorts of old rubbish. The council are pretty good at clearing once you let them know its there but I do hope they follow up by knocking on the houses that the sofas /mattresses are dumped outside of. I can’t understand people dumping old mattresses in the street, and there seem to be so many of them. Unfortunately they don’t always dump them out side their own houses, which is worse in some ways. I noticed today that the pile of corrugated asbestos roofing has been removed from the Lane, though the pile of old tyres is still there.